The danger in naming your movie The Spectacular Now is that it creates unreasonable expectations. If it falls flat, you’ve made the job of film critics everywhere all too easy: the headlines will read “Not so Spectacular” or “The Spectacular Not.” Thankfully for all involved, the film is certainly nowhere near bad enough to warrant that kind of lazy criticism. It may not be terrible enough to inspire trite wordplay, but it’s not quite spectacular either. For most of the film, the strong chemistry and charisma of its leads overcome the inadequacies of a script that starts to stray courageously far from the teen movie formula – before a predictable, trite third act brings the whole thing down a notch. Still, what an engaging two-thirds of a film it is. The show clearly belongs to Miles Teller (Rabbit Hole, Project X), who plays Sutter, a kid at the tail end of high school and the beginning of a serious drinking problem. His girlfriend has just broken up with him, and on the rebound, he takes up with Aimee (Shailene Woodley), a shy but pretty wallflower. His friends question his interest in her, but he alone sees her potential. And a million other generic teen movies. 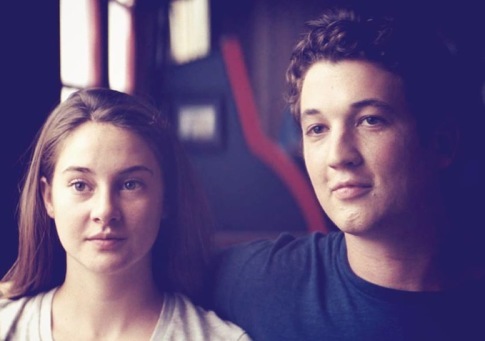 It sounds formulaic, but within a few minutes of The Spectacular Now, you may have a startling realization: you are watching real people, not some adult’s idea of what teenagers look and sound like. Teller, for example, captures the unique, hard-to-define look of a boy at the end of his adolescence. He is tall and built, but his face still has the shape of the innocent kid he was just a few years earlier. That Hollywood perfection – usually, a polished, twenty-five year old model playing a teenager – is nowhere to be found here. While Teller gets the showiest performance, Woodley is every bit his equal, following up her breakout role in 2011’s The Descendants with another stunner here. Her Aimee is one of those stock teen movie characters at first, not too different from Rachel Leigh Cook in She’s All That or Molly Ringwald in Pretty in Pink. But as she grows closer to Sutter, her innocence betrays a heartbreaking ignorance; we may know Sutter well enough to know he’s going to hurt her, but she doesn’t, and watching it play out is an often painful experience. Of course, this deconstruction of teenage stereotypes is not exactly new. Ringwald herself and The Breakfast Club comes to mind. But that film spent ninety minutes working through its stereotypes; The Spectacular Now disposes of them in an early scene. “What’s your thing?” Sutter asks Aimee, rattling off a few stock teenager characters that we recognize from those John Hughes movies: “stoner”, “rich kid,” etc. “I like to think a person can’t be summed up by just one thing,” Aimee replies, and the movie takes her philosophy to heart. Director James Ponsoldt (Smashed) clearly knew that he has something in Teller and Woodley; in the film’s best scenes, he cedes his ground to them and lets the youngsters create their own chemistry. The adult actors, however, don’t fare as well. Jennifer Jason Leigh, whose first role was in one of the genre’s seminal films, Fast Times at Ridgemont High, never quite creates a character as Sutter’s single mom, whose version of parenting is simply trying to keep him away from his estranged father (Kyle Chandler). When Sutter finally tracks him down, it’s every bit as predictable as you would expect, and it’s the only time that the film really lags. But the adult characters are largely superfluous, so it’s not surprising that they would fail to resonate. This is a movie that treats its teenage characters like adults. In no way is The Spectacular Now a story about teen drinking; it’s a movie about drinking, and Sutter’s journey is one that probably as many twenty and thirtysomethings relate to as do teenagers. The fact that such a story could even be told about a teenager and seem realistic lends itself a nagging question that the movie left me with: are we turning these children into adults too quickly, or are we staying children far too long? A movie that inspires that level of thinking through original, believable characters is easy to recommend. ← Wait a Minute…Is 2013 A Great Year for Movies?